These files are offered free, under Linkware licence. Simply drop your link in forum! = Produc sheet or demo available, = Members only. Environment Canada 7 days multilingual forecast module in short format for Weather Blues v2. New! 4 styles / 3 different sizes! NOAA - National Weather Service forecast page for Weather Blues v2 Template. updated. Weather Blues Template (HTML version) For simple installation. Now, detect your station and UFT-8 compilant (need Cumulus b.1093+). Environment Canada forecast for 7 days in detailed format for Weather Blues v2. Now multilingual! 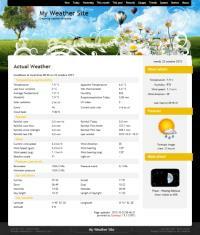 Weather Sky v1.1 template. Major update! All newest enhancements included! Cumulus v.1.9.4 compilant. Sunny Weather - Complete weather website template for Cumulus 1.9.4 -- with 3 different system page and Day/Night forecast icons! New records page. Weather sunset new v1.2. Cumulus v1.9.4 compatible! All most recent enhancements and famous SteelSeries gauges included, now UTF-8! Flying weather gauges set for Weather Blues v2. Fly over your location and display weather in a never seen before way! Linkware licence is simple, you only need to drop a post in the forum with a link to your weather website. Like this, I could travel around the world to see beautiful websites. Also, please, respect Copyrights! Since designers and programmers has spent a lot of time freely to offer you these beauties, keep copyrights intact! As visitor you can view all available files. To download "member" files, you have to register in our forum.